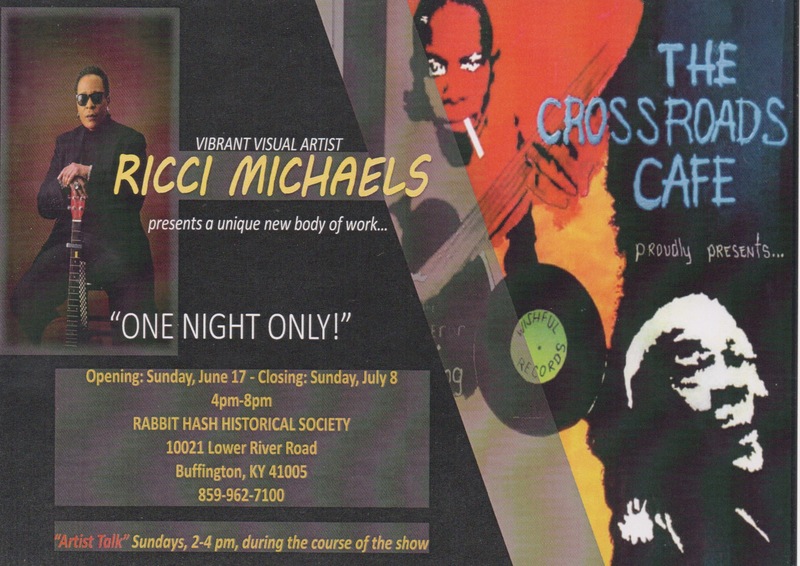 The Rabbit Hash Historical Society, in conjunction with Ten Talents Network is proud to announce “One Night Only”, a one-woman art show featuring award winning Cincinnati artist Ricci Michaels. 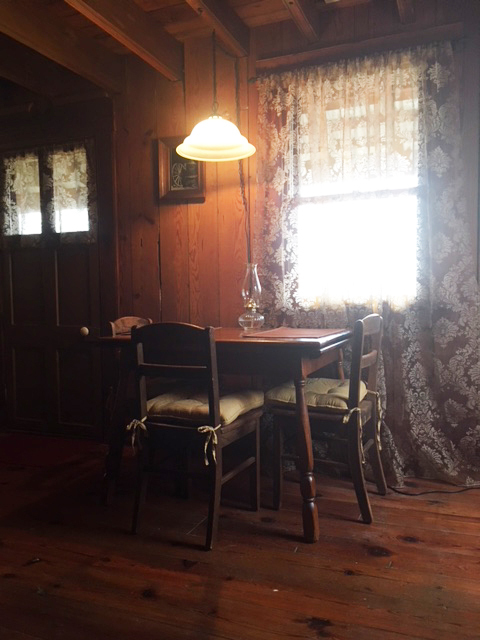 The show will open on Father’s Day, Sunday June 17th from 4-8 pm in the Lowell Lee Scott Visual Arts Center in the barn in Rabbit Hash. All are invited. ​Cincinnati visual artist, muralist and poet, Ricci Michaels will be a guest of the Rabbit Hash Historical Society, ushering in Rabbit Hash’s very first multi-cultural event. 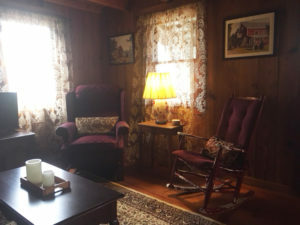 Although RH has featured many local artists at the annual Old Timers Art Show, this one-woman show is another first in the longstanding river town. Michaels work has been shown in such prominent galleries as the University of Cincinnati Law Library, Art Beyond Boundaries Gallery, the Cincinnati Art Museum and the Cincinnati Freedom Center. Ricci is the President of the ​Urban Expression 101 Project,​ a community outreach program that promotes healing thru the arts with a focus on women, veterans and those coping with the effects of PTSD. Her statement of purpose is “ I believe self-expression is vital to the human spirit” and she works continually to provide a platform that will inspire and enhance the quality of that expression. The show will run from Sunday, June 17 – Sunday, July 8. After June 17 the gallery will be opened by appointment. Call (859) 468-5366. 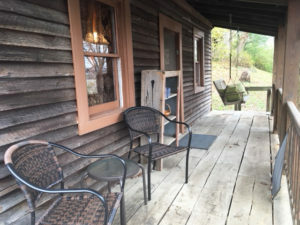 Kick back and relax in the undisputed Center of the Universe: Rabbit Hash KY. 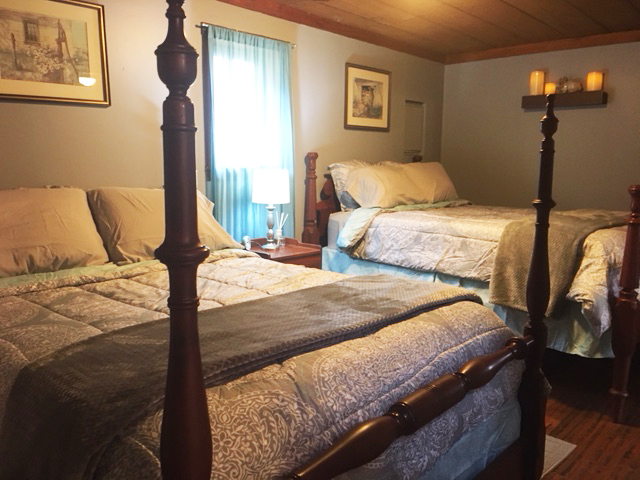 This tastefully decorated house in an Historic District on the scenic Ohio River bank features 1 bedroom with 2 double beds, a full, completely equipped kitchen, a full bathroom with towels and amenities, and a great room with seating, dining and office areas. There is a covered front porch with seating and a porch swing, to relax and watch the river roll by or people watch during peak days. The house is heated, air-conditioned, is equipped with DVD’s, books, games and has free wi-fi. The original front section of this historic building was built in the early 1900’s and used as an obstetrician’s office for 20 years. 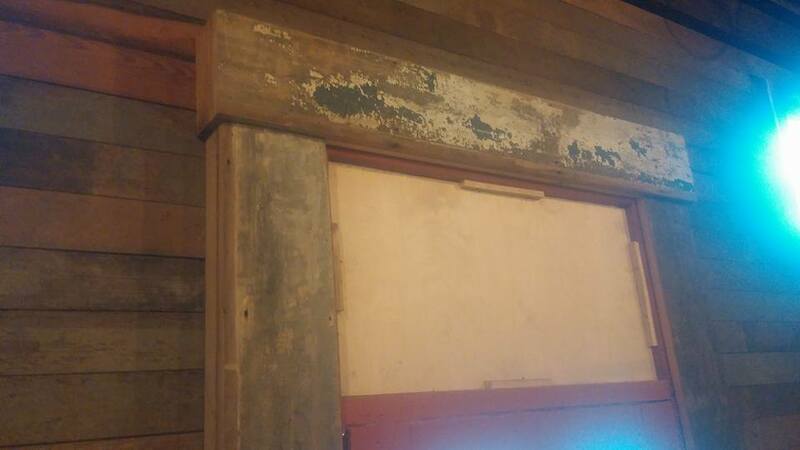 The back half was added sometime around 1950. On weekends during warm weather, the town can get quite noisy, however during the week and weekend mornings and evenings tend to remain serene. Rabbit Hash is host to many music and artistic events throughout the season. The art show will also be open on Old Timers Day so be sure to stop by the gallery on the second floor of the Rabbit Hash barn. 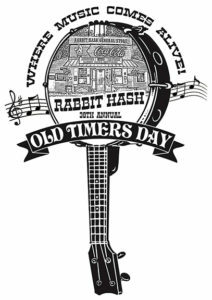 Saturday, September 2nd, 2017 is the 38th Annual music festival in Rabbit Hash celebrating the long standing rivertown community that has thrived on the banks of the Ohio since 1831. Our annual festival features local bands, food vendors, artists, and general merrymaking. The festival runs from 10 a.m to 10 p.m. 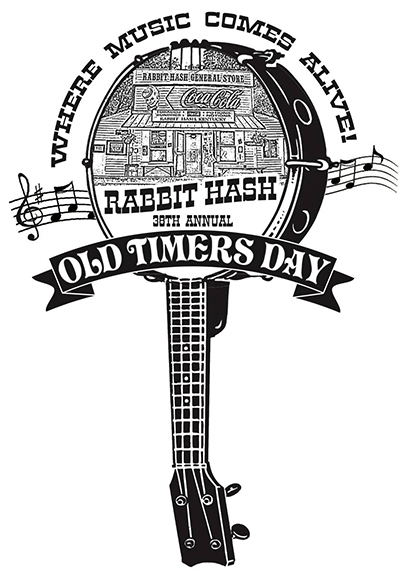 This is a special year for the Old Timers Day festival because it rejoices the return of the iconic Rabbit Hash General Store after a devastating fire that happened a year ago in 2016. The music lineup this year is fantastic as always – and it is listed below. As usual, coolers are not welcome, but kids, dogs, and carpooling are highly suggested! 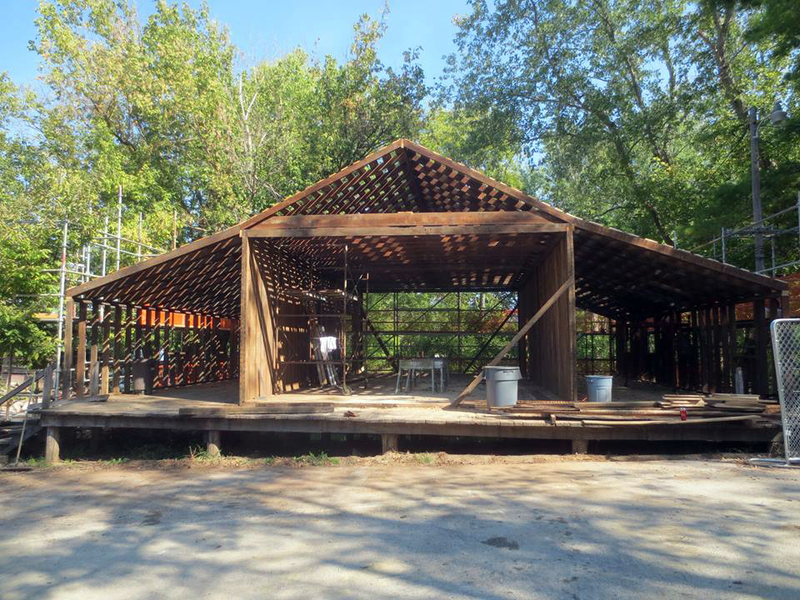 We’d like to thank all of you who visit, support, and love Rabbit Hash KY. It has been amazing to see the influx of visitors who supported the restoration, care about our history and want to experience the town for themselves. If you are planning a visit of your own, here are some things you might want to know. The Rabbit Hash Historical Society own the grounds and the buildings that sit on them. The buildings house businesses that rent them from RHHS. Each business is it’s own unique entity, so they won’t be able to let you into other buildings in town. Mayor Brynn does not live in town. She is usually here on the weekends, but if the main reason for your visit is to meet the mayor, please make prior arrangements via her Facebook page at www.facebook.com/brynneth.pawltro/. Keep in mind her availability is sometimes limited. The Rabbit Hash General Store is open from 10:00 am to 7:00 pm Monday through Sunday. The general store is the only business in town open daily through the work week. and a coffee shop which opens at 10 and closes when they’re out of product. Rabbit Hash Historical Society has no “staff”, employees or grounds crew. We are all volunteers. Please keep this in mind when its time to dispose of your trash and cigarette butts, and use the proper receptacles! 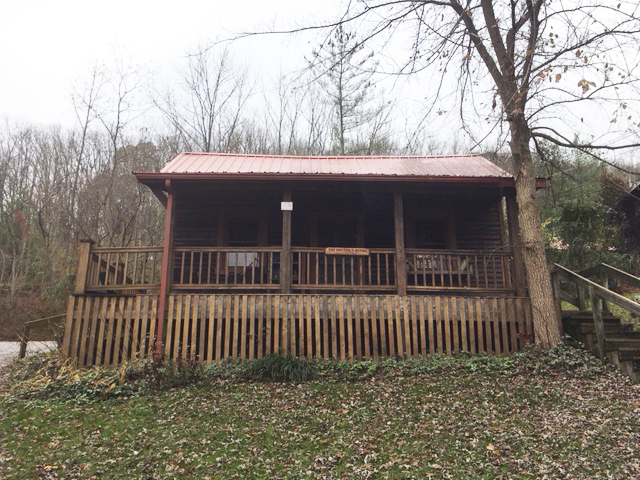 Our public facilities are port-o-lets housed in a permanent building and are serviced on a regular basis. As an historic place, this is a vast improvement on what would have been available in 1831! 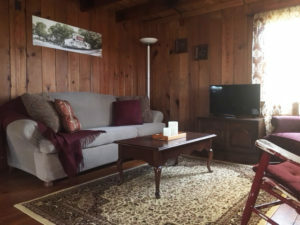 We hope you can enjoy our town for what it is… a little place time forgot, a place to sit back, relax and watch the river roll by, the Center of the Universe! The Ida Lee Willis Memorial Award is presented to the individual who has demonstrated outstanding dedication to the cause of historic preservation in the Commonwealth. The 2017 recipient is Linda Bruckheimer of Bloomfield and Los Angeles, CA, who is being recognized for more than two decades of preservation philanthropy, investment and advocacy at the local, state and national level. Linda has dedicated considerable resources to preserving and protecting the central Kentucky landscape. 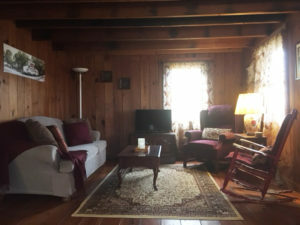 She has also been an active member of the board of the National Trust for Historic Preservation, through which she and her husband established the Linda and Jerry Bruckheimer Fund for Kentucky, which supports the preservation of historic buildings, communities and landscapes throughout the Commonwealth. Ida Lee Willis was the first executive director of the Kentucky Heritage Commission (now Heritage Council) and widow of former Gov. Simeon Willis at the time of her appointment in 1966. The foundation was chartered in her memory in 1979 to create an annual awards program and honor her legacy. The awards are presented each May during National Historic Preservation Month and recognize excellence in the preservation of historic buildings and cultural resources through investment, advocacy, volunteerism, building partnerships, public involvement, lifelong commitment or significant achievement. The year 2016 was a rough one here in Rabbit Hash. As we diligently continue work on the restoration of the store, we all are saying “good riddance.” The best plan is to let go of all the negatives of 2016 and make way for a very positive and exciting 2017. The past month between Christmas and New Year’s has actually been a very happy, joyous and productive time. 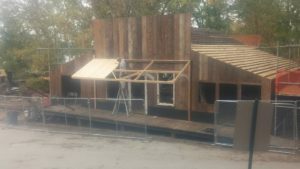 The interest and energy emanating from the store’s progress is so palpable around Rabbit Hash and the rest of Northern Kentucky. This year’s Christmas parade was the best ever in its five year tradition. I heard someone say that it did actually last over one minute! The Belleview Mackville Rabbit Hash Fire Department was kind enough to bring all of their equipment (except for their coffee maker) and managed to get every neighborhood dog to join in on the singing. All the floats were exceptionally done and decorated, even considering the rule that they had to be put together on the day of the parade. We were so happy to be able to have the new ‘old’ store open for the parade visitors and the porch available for the viewing stand. Terrie’s paper-Mache snowman and Lin Unterreiner’s Christmas trees made from the discarded scraps of the store’s flooring made the interior look just like the Santa’s Workshop that it was. Thanks to Ed, Eddie, Dustin and Brandon and their combined talents and dedication, close to forty benches were made and sold in order to raise funds for the new fire suppression system for the store. The benches were all made from the unusable remnants of the original 1831 Ohio River barge timbers that were dismantled and used as foundation floor joists for the original building, one hundred eighty years ago. Just think of all the floods and mud those timbers have endured, yet kept that National Register structure safe and intact! Each bench was unique and one-of-a-kind. They all showed the scars of the ravages they endured over these many years. Some were charred from the fire; others hacked, cut, hand hewn, nailed, drilled, bolted and so forth. Each one told a different story, and instead of being discarded or left to rot, thanks to Ed and the guys, they all have a new life and a new appreciation. 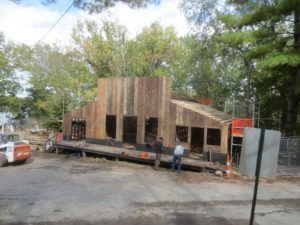 You could just read the joy and the pride of the people who purchased them for their very own permanent reminder of that very first building that became our beloved Rabbit Hash General Store. The best news of 2017 is that we don’t think the opening of the store is going to take as long as we first projected. It is not going to take until late summer and Old Timers Day. We would really like it to be on February 13, 2017—-one year to the day it burned (just for the non-believers)—–but that may be pushing it. Early Spring, however, is certainly not out of the question. Updates will be posted. As you all know, irreplaceable artifacts were either consumed or completely ruined by the fire. 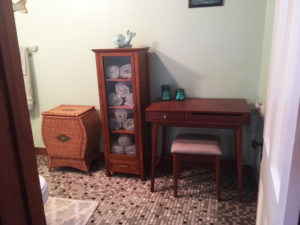 It is so encouraging when people come up and say, “oh, I have this or that piece that belonged to my grandma that you can have to put in the store when it’s done.” We appreciate and cherish those offers and artifacts. Thank you all. 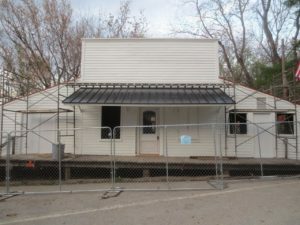 I am also happy to report that Shaker Village of Pleasant Hill, down in Harrodsburg, Kentucky, is donating some of their artifacts that they no longer use or display there to permanently put in our store. How great is that? Work on the store this week and next will consist of the installation of the fire suppression system; the rest of the electrical work and insulation in the ceiling; the interior door and window trim; and the washing of the walls and painting. All the art and memories are now sealed away safely and securely in their time capsule behind the walls, and the right shed room already has its primer coat of Rabbit Hash white applied. I wonder if we could get Scott Risner and The Buffalo Wabs and the Price Hill Hustle to play the very first music in the new ‘old’ store since they were the very last musicians to play there before the fire? Good things take a little time! Have faith. Rabbit Hash’s recent mayoral election has gained some international attention! The Barking Hour, a weekly BBC radio show for dog lovers, will be mentioning our election on Thursday, December 8th (10:00 a.m. “Kentucky” time) during their international news segment. You can listen to the show, hosted by Jo Good and Anna Webb, on the TuneIn app or online at BBC Radio London! 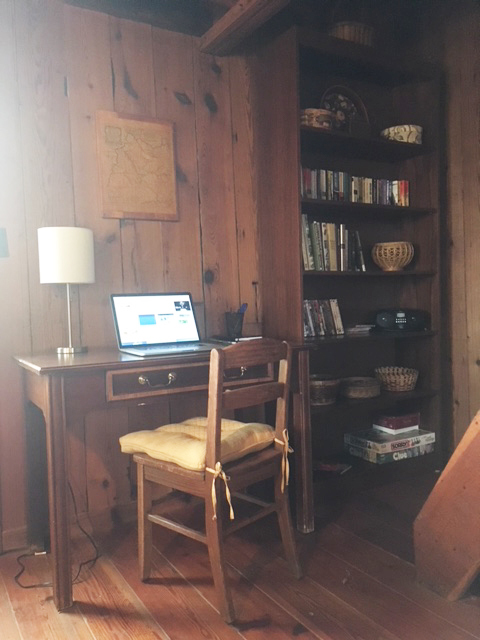 The reason I have not posted a blog update recently is because pictures are worth a thousand words and that was best accomplished by posting on face Book. 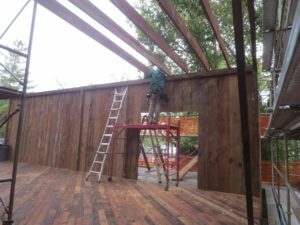 Daily posts with photos helped to keep everyone up close and personal with the progress of the restoration of the Rabbit Hash General Store. 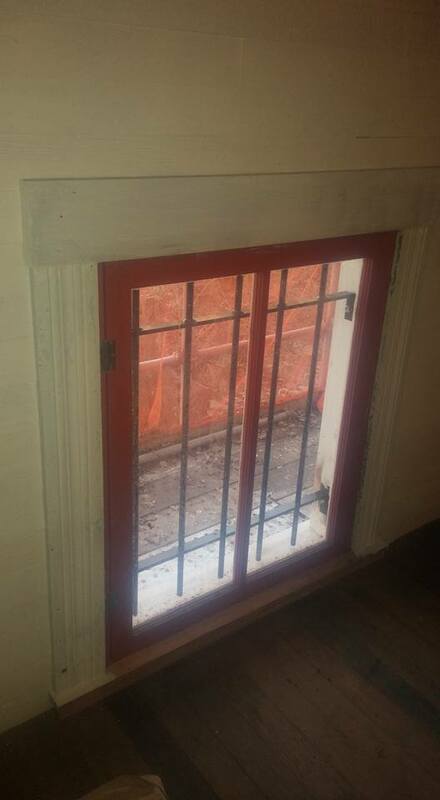 Yesterday, we reached a very important milestone in this unprecedented restoration. The completion of the billboard sign and the application of Sprite, the vintage Coca Cola mascot, was the crowning jewel or the icing on the cake of the completion of the historic façade of our beloved iconic centerpiece of the Rabbit Hash, Kentucky National Register District. When dealing with a National Register Structure, it is the exterior façade of the structure that satisfies the requirements for National Register eligibility. 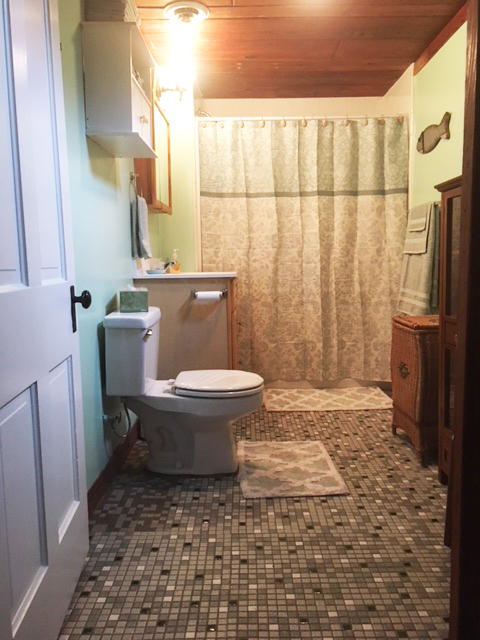 The dedicated craftsmen of Rivertown Construction Inc made sure that every detail, method of construction, fabric and material were as close to original as was humanly possible. In this, they exceeded beyond requirement by the Department of Interior’s Guidelines for Historic Preservation. They took this restoration very personally. They are to be highly commended and praised for their unique professional approach to a seemingly impossible task and project. I feel certain that some award will eventually come their way and they will be regarded on a national level. 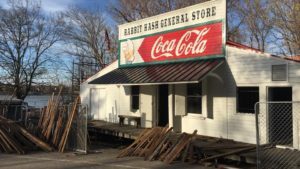 The decision to allow the damaged Rabbit Hash General Store to be restored and retain its National Register status required the consent and cooperation of a myriad of national, state-wide, and local regulatory bodies. With approximately seventy-five percent of its original state still standing, the historic mercantile structure filled the requirements for a restoration, which is semantically much different than renovation, rehabilitation, rebuilding, retrofitting, remodel and all the similar such words. This project is a restoration. As it stands right now, it fits all the requirements of the Department of Interior and is considered to be its former National Register Structure. Now, the caveat. 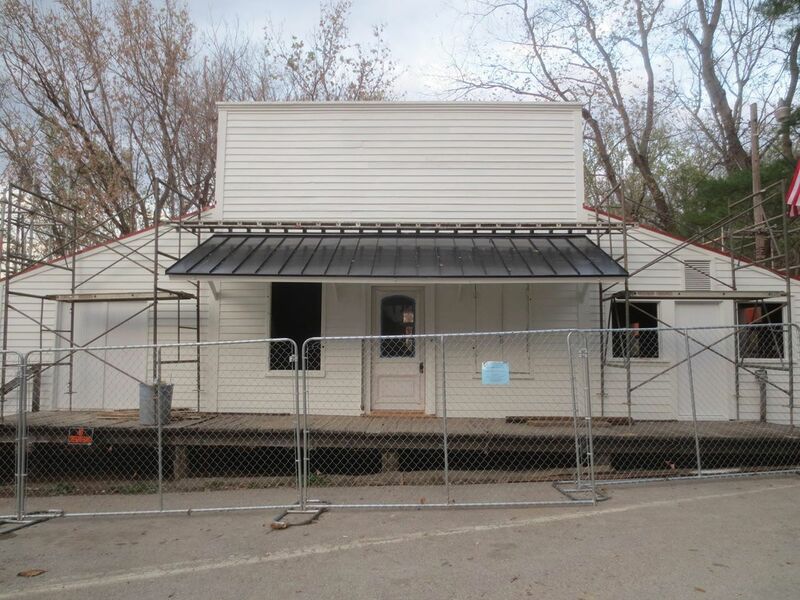 Just because the General Store appears to be its old self does not mean we are finished, nor close to opening for business. It would be a fair estimation to say it is about one third complete. 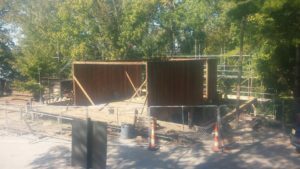 Our goal, since day one of the foundation work, after all the necessary permits were issued and in-hand, has been to get the exterior completed and the building completely closed up before cold weather set in. That happened this morning! Talk about meeting a deadline. Had it not been for the unusually mild November weather, the exterior would not have been painted until Spring, and, of course, the billboard sign would still be a wish. It would be safe to say that the official opening will coincide with the 2017 Old Timers Day celebration. Hopefully we will be planning a week-long celebration of festivities, food, music and fun. So, stay tuned. Many people believe in many different things, but I am convinced that providence had a major hand in this entire project and process. Call it God’s will, Karma, voodoo, black magic, a miracle, coincidence or whatever you like, but for some reason the stars and the planets aligned just right for what eventually happened. The interior work will begin on Monday. I am calling this Phase Three (foundation Phase One; exterior Phase Two) and it will be the most time consuming of all three. 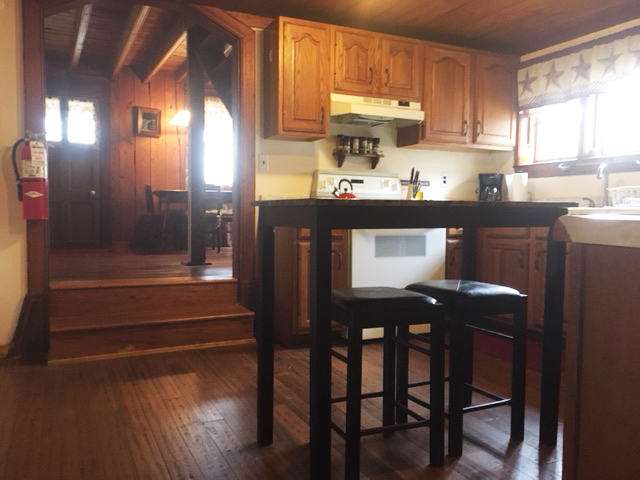 There is a lot tedious, intricate and detailed carpentry work involved in the flooring, walls, ceilings trim and shelving throughout the three rooms. We are poised and postured to treat the interior of the building in the very same manner as the exterior, using as much original material as we can, complemented by similar, vintage material and using the same period-appropriate construction techniques. 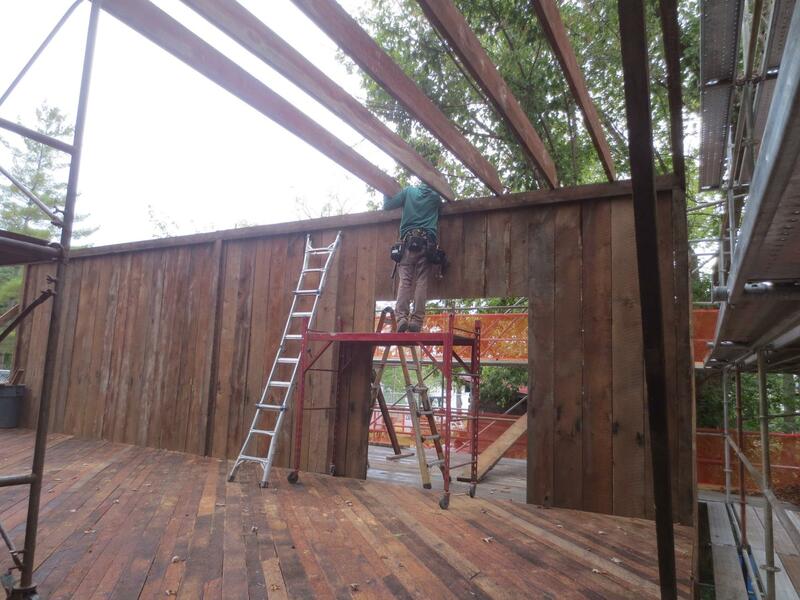 Doing the interior in this manner is not required in order for the store building to remain on the National Register. We are doing it this way because she deserves it! So, once again I say, “good things take a little time, a little bit of yours and a little bit of mine.” (From a song by Dan’l Wilson, one-time General Store proprietor). 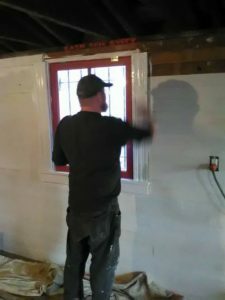 In addition to all of this interior restoration, we will also be installing electrical; furnace and ductwork HVAC; special watertight dense-cell spray foam insulation and traditional attic insulation; a fire suppression system; a state-of –the-art walk-in cooler with removable, external compressor (in the event of a flood); and a new(er) Rabbit Hash Iron Works wood stove and stove pipes (courtesy Louie Scott). That’s not all. In order to complete the restoration, one coat of primer and two coats finish everywhere except the (original) floors. There is one other thing that needs to be addressed here. 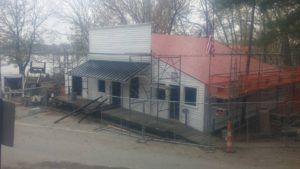 Right after the fire and during the fundraising stages of this project, there was a lot of evil, unfair, and cruel accusations leveled against the Rabbit Hash Historical Society as a board, as well as against certain individual members. Several unnecessary bridges were burned, never to be rebuilt. Despite cruel and demeaning accusations about the funds raised for this restoration and degrading the integrity of our organization and its members, we persevered and carried on as our hearts, souls, passion and conscience dictated. This was culminated yesterday by the topping off ceremony. 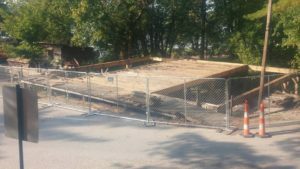 As president of the Rabbit Hash Historical Society, I can personally give account and proof of every penny raised in our name and every penny spent in the name of this unprecedented historic preservation undertaking. Have a loving and blessed Thanksgiving and a very happy and Merry Christmas…. 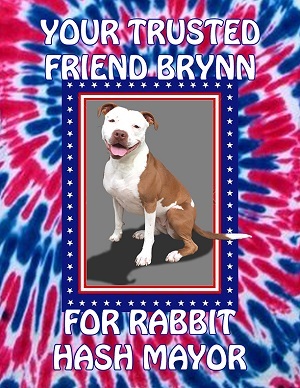 BRYNN is the new Mayor of Rabbit Hash Kentucky!!! In an unprecedented move, the Rabbit Hash Historical Society has given official positions to the 1st and 2nd runner ups, Bourbon and Lady, as Ambassadors to Rabbit Hash. In the case that the official mayor is unavailable for an event or obligation, the Ambassadors will fill in. Mayor Lucy Lou said that she has has been honored to serve for the past 8 years. Through the course of a tense evening of voting she sniffed the butts of all the candidates and has given her approval to the Mayor elect, Brynn. She looks forward to working with the new mayor and the Ambassadors as Rabbit Hash strives to restore the General Store. She sincerely thanks ALL the candidates for their efforts to raise funds for Rabbit Hash.